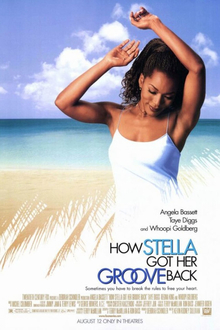 How Stella Got Her Groove Back is a 1998 American romantic comedy-drama film directed by Kevin Rodney Sullivan, adapted from Terry McMillan's best-selling novel of the same title. The film stars Angela Bassett, Taye Diggs (in his film debut), Whoopi Goldberg, and Regina King. The original music score was composed by Michel Colombier. Stella Payne is a very successful 40-year-old stockbroker raising her son, Quincy, and living in Marin County, California, who is persuaded by her best friend from college, Delilah Abraham, to take a well-deserved, first-class vacation to Montego Bay, Jamaica. As she soaks in the beauty of the island, she encounters a handsome young islander, Winston Shakespeare, who is twenty years younger. His pursuit of her turns into a blossoming romance that forces Stella to take personal inventory of her life and try to find a balance between her desire for love and companionship, and her responsibilities as a mother and corporate executive. The reception from critics was mixed. On Rotten Tomatoes the film has an approval rating of 49% based on 49 reviews. On Metacritic the film has a score of 56 out of 100 based on reviews from 23 critics, indicating "mixed or average reviews. Audiences surveyed by CinemaScore gave the film a grade A-. In its opening weekend, Stella grossed $11,318,919, ranking #2 in the domestic box office behind Saving Private Ryan's fourth weekend. The film would go on to gross $36,672,941 domestically and an additional $1,605,781 overseas for a worldwide total of $39,278,722. From an estimated $20 million budget, this can be considered a moderate success. A soundtrack containing mostly R&B and reggae was released on August 11, 1998, by MCA Records. It peaked at number eight on the Billboard 200 and number three on the Top R&B/Hip-Hop Albums chart, and was certified gold on September 22, 1998. ^ "HOW STELLA GOT HER GROOVE BACK (15)". British Board of Film Classification. 1998-11-17. Retrieved 2013-02-03. ^ Gene Seymour (August 21, 1998). "Angela Bassett Reaches a Stellar Groove at Last". The Los Angeles Times. Retrieved 2010-12-22. ^ Stephen Holden (August 14, 1998). "FILM REVIEW; He Likes Video Games? Nobody's Perfect". The New York Times. Retrieved 2012-06-03. ^ Margaret A. McGurk (August 14, 1998). "Bassett gets her groove". The Cincinnati Enquirer. Archived from the original on October 22, 2012. Retrieved 2012-06-03. ^ Roger Ebert (August 14, 1998). "How Stella Got Her Groove Back". Chicago Sun Times. Retrieved 2012-06-03. ^ "Weekend Box Office Results for August 14-16, 1998". Amazon.com. Box Office Mojo. 1998-08-17. Retrieved 2013-02-03. This page was last edited on 26 February 2019, at 02:22 (UTC).